In early Nov 2006, I visited the city of Taipei in Taiwan, and naturally set aside a little bit of time to visit sites of historical value. World War 2, in particular, of course. The Memorial Hall, designed by Yang Cho-Cheng, was officially opened on 5 Apr 1980. 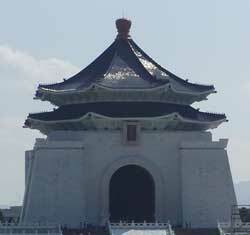 Since then, the main memorial building along with the park grounds had been a main tourist attraction of Taipei. The blue and white building, flanked by red flowers at certain times of the year, symbolizes the "blue sky, white sun, blood-red earth" flag of the Republic of China. The three colors, in turn, represent democracy, the people, and the blood of the martyrs of the 1911 revolution. In the main hall, a large bronze statue of a merciful and father-like Chiang overlooked the entrance, guarded on both sides by personnel of the Chinese military. Chiang's ideals on the Chinese democracy could be found on the interior walls. There is a research library and an exhibition hall in the lower levels of the memorial. The exhibition hall usually displays topics relating to Chinese history during Chiang's leadership, though at the time of my visit the space was being used to display contemporary artwork done in traditional Chinese styles. A souvenir shop and a post office can be found in the lower levels of the memorial as well. While Chiang's personal ambitions and his corrupt government often brought criticism upon him, this memorial is represents the Chinese people's appreciation for his leadership during a tumultuous time in Chinese history riddled by the 1911 Revolution, the war against warlords, the Second Sino-Japanese War (WW2), and the Civil War against the Chinese Communists. 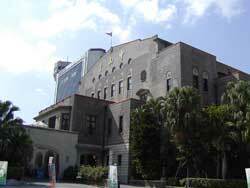 The Japanese occupation forces constructed this building of Uheiji Nagano's design between Jun 1912 and Mar 1919 to serve as the office of the Governor General of Taiwan. During WW2, American bombings damaged the building, and repairs were done between 1947 and 1948. In 1949, when the Republic of China began to withdraw to Taiwan, recently officially renamed as Taiwan, it became a military office. In 1950, it became the seat of government again as the Office of the President of the Republic of China, a role that it still retains today. During my visit, President Chen Shui-bian was under political turmoil with corruption charges. Numerous large-scale protests had been going on for several months, and the appearance of the Presidential Palace reflected the political mood. Additional troops, armed with assault rifles, were deployed outside the office building as well as the presence of additional police at surrounding street corners. Barbed wire was also set up around the perimeter, making travel in the immediate area a bit troublesome. After navigating the maze of obstacles, I was finally able to get close to the building. The architecture is of typical Japanese design of the time, with red brick exterior accented by areas of exposed concrete. The 11-story central tower seemed to emit an aura of authority upon me, reminding me that the building housed the highest-ranked office in the Republic of China. In 1928, the Japanese occupation government in Taiwan decided to erect a new city hall for the city of Taipei to celebrate the coronation of Emperor Hirohito. When the construction of the new four-story Taipei City Hall completed on 26 Nov 1936, it became the fourth largest city government building in the entire Japanese Empire, smaller only to the city halls of Tokyo, Osaka, and Nagoya. On 25 Oct 1945, the Taipei City Hall became the site of the formal surrender ceremony that turned Taiwan back under Chinese control. Chen Yi represented the Republic of China and accepted the surrender document presented by Japanese General Rikichi Ando. 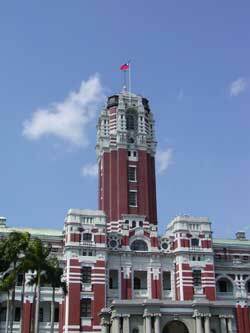 The Taipei City Hall building was then renamed Zhongshan Hall in honor of Dr. Sun Yatsen and continued to serve as a government building for many more years. It was the site where the Sino-US Mutual Defense Treaty was signed and it hosted foreign dignitaries such as US President Richard Nixon and Korean President Lee Chen-Wing. Today, Zhongshan Hall serves as a stage for performance arts. During my visit, I was able to speak to someone at the front reception area who confirmed the rich history of the building. Unfortunately, there were no historical exhibitions at that time, and the actual hall where the surrender ceremony of 1945 took place was not open to public because it was being prepared for an upcoming performance. MY BROTHER WAS KILLED IN AN AIR RAID OVER FORMOSA,MAR.23rd,1945. HE WAS IN A B24.